Cole's Perfect Puppy by Frances M Crossno is a delightful, captivating and award winning Christian novel for young children. Cole longs for a puppy and is thrilled when Uncle Bobby and his girlfriend give him an exciting Christmas gift - he and his younger brother, Caleb, are convinced it is the long-for pet. But, no, it turns out to be a cute… well, you’ll have to read the book to find out! Then the owner of a local pet store offers Cole an after-school and Saturday job helping take care of the puppies at his shop. Cole's goal is to save up his earnings to buy Scarlet, his favorite golden retriever puppy, and to help friend in need, Rachel. All sorts of mayhem, mysteries and challenges unfold for the children, but they are determined to find a way. The cover is adorable, and a black and white picture of little Scarlet is depicted again at the start of each short chapter. The plot unfolds at a good pace, bouncing along with plenty of fun. The characters are believable and young readers will identify with Cole’s wish for the mischievous, loving little puppy. The sense of caring for animals and the strong bonds that can grow between humans and animals are conveyed very well. Rachel is a Christian and shares her faith with her new friends, Cole and Caleb, in an open and natural way. She is an inspiring young character, having lost her father in the Iraq war and been forced to move out of her home with her mom. I love the effect she has on Cole, who is prepared to make sacrifices to help her, putting her needs before his own. When Cole begins to pray himself, amazing things happen. The boys find that even when events seem to have taken a turn for the worse, God still has everything under control. The writing style of Cole's Perfect Puppy is engaging and fun and I very much enjoyed reading it. Frances M Crossno weaves the Christian message about faith and trust in God into this entertaining story in just the right way. The themes of this novel – friendship, sacrifice, and trust in God’s love – are nurturing messages for all readers. A special story, then, that entertains and shares the Christian message in a gentle way. Great for story times, and for more confident or older readers to read themselves. Recommended. Cole's Perfect Puppy: Perfect Puppies Series, Book One is a Christian novel for children and preteens written by Frances Crossno. Cole was getting nervous about the time as his little brother, Caleb, endlessly puzzled over his choice of video games. It was getting late, and the boys had promised their Uncle Bobby that they would be home before it got dark. There was still one more very important stop to make in the mall -- Cole wanted to see the puppies at the Dog House, the mall's pet store. Christmas was almost here, and Cole had his heart set on getting a puppy. It would be a strange Christmas as his parents were both away on business, but Uncle Bobby had stayed with the two boys before. When they finally got to the Dog House, it was crowded with shoppers, but Cole fell in love with his puppy from the moment he saw her. She was reddish-gold in coloring and full of energy, fun and mischief. Her name was Scarlet, and even though Cole ended up getting a pot-bellied pig for Christmas, he would do everything humanly possible to get that very special Golden Retriever puppy. Frances Crossno's Christian novel for children and preteens, Cole's Perfect Puppy, is a heartwarming story that's perfect for holiday reading. I winced a bit with Cole as he discovered the pet pig under the Christmas tree instead of his puppy, and was relieved when Dandy, the pot-bellied pig, and Caleb bonded and became the best of friends. The descriptions of Scarlet's adventures throughout the crowded mall filled with Christmas shoppers are hilarious. Only Cole seems to have the key to Scarlet's heart, and he's determined to make her his. Faith plays a big part in this enjoyable tale, the type of faith that recognizes the sacrifice Jesus Christ made for his people and the love God has for all His children. It's also faith that shines out in the boys' friend, Rachel, and inspires the generosity of both Caleb and Cole in the story. Cole's Perfect Puppy is well written, has a grand plot, and it is highly recommended. 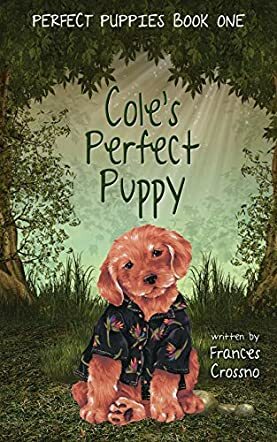 Cole’s Perfect Puppy is the first book in the Perfect Puppies series, written by Frances Crossno. With their parents away, Cole Jackson and his younger brother, Caleb, stay with their Uncle Bobby until their parents return home. Cole wants nothing more than a puppy for Christmas. Eager to look at the puppies at Dog House (the local pet store), the boys push through the crowd and peek into the store window. After the store manager, Mr. Morris, takes one of the puppies out of its cage and passes it around, one of the teenagers drops the puppy to the floor and it escapes the confines of the pet shop. With half of the mall giving chase, the puppy is safely returned to Mr. Morris. The boys sit with Caleb’s school friend, Rachel, known at school as 'wrinkly Rachel' because of her wrinkled clothes, while waiting for their uncle to pick them up. On Christmas morning, Cole receives a pot-bellied piglet as a gift, which he calls Dandy. When he takes Dandy for a walk, he runs into Rachel and learns of her tragic life. After running into Mr. Morris once again, Cole is offered a part-time job to help him fulfil his dream of buying his own puppy. Forgetting all about Dandy, a new puppy becomes the most important thing in Cole’s future, until tragedy strikes at home, forcing him to reassess his priorities. Frances Crossno’s children’s book is a delightful read and is extremely well written. It addresses bullying to a degree, as well as not realizing how much you have until you suddenly have to do without. Rachel’s friendship becomes a very big part of both Cole’s and Caleb’s life. Her tragedies are felt by the boys, showing that they are able to think of other people besides themselves. It also teaches that people need to make the most of what they have, rather than dwell on what they do not have, and to be grateful for every gift of a new day. There are also some elements of Christianity in Cole’s Perfect Puppy, which are reflected in the lessons Rachel teaches to Cole about the Bible on Christmas Day, as well as in the bonus quiz at the end of the book. Although purchasing from pet shops and giving live animals as gifts for Christmas is something I do not condone, the messages behind each action in the story carried a strong meaning. With humor injected at just the right moments, I very much enjoyed Cole’s Perfect Puppy and recommend it to animal lovers, young and old, who enjoy adventure, comedy, drama and real-life social issues wrapped up in a four-legged furry package. A new children’s book series is launched; Perfect Puppies Series Book 1 introduces a family and the difficulties Cole faces in bringing his cherished puppy home. Cole and his younger brother Caleb frequent the local mall. Cole’s main attraction is the Dog House, a pet store with puppies in the front window. The first time he met a frisky golden retriever puppy named Scarlet, running through the mall, it was love at first sight – for both of them. Frances M. Crossno, the author of Cole’s Perfect Puppy, tells the convoluted story of Cole and Scarlet, with its many twists and turns. Along the way, the young reader is introduced to Dandy Danny, a pot-bellied piglet; the brothers’ friend, Rachel, who always wears wrinkled clothes; Mr. Morris, the pet store owner; Mom and Dad and Uncle Bobby. While there is plenty of action in the children’s novel, Cole’s Perfect Puppy by Frances M. Crossno, there are also plenty of lessons for young children. Not only do the brothers learn about responsibility, sacrifice and working for personal goals, they also learn compassion for others less fortunate than themselves. Ms. Crossno interweaves Christian principles and the power of prayer throughout the book. Her writing is age-appropriate, and the story is fun, adventurous and thought-provoking, keeping young readers engaged. There is an authentic tone, as all the characters are approachable, and the narrative sections are realistic. Eventually everything works out, as a result of good efforts and prayer. Children of all ages will enjoy this delightful book – and learn important values as well.